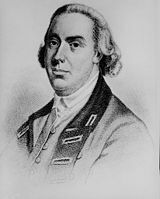 Thomas Gage (1719 – April 2, 1787) was a British general and commander in chief of the British North American forces from 1763 to 1775. His aggressive actions against the colonists contributed to the hostilities between the American colonies and the United Kingdom and serve as a direct cause of the American Revolutionary War. In 1774 Gage became governor of Massachusetts, and attempted to extinguish the animosity and continue a tradition of suppression by attempting to implement and enforce the Intolerable Acts. To quell the growing sense of rebellion among the colonists, Gage sent troops to seize the colonial arsenal at Concord, Massachusetts. The battles of Lexington and Concord on April 19, 1775 resulted in a humiliating British defeat. There and on their return to Boston, Gage's troops suffered heavy losses, harassed by colonial militia ever step of their return trip. After the Battle of Bunker Hill June 17, 1775, he was criticized for the heavy British casualties. His continued style of control did little to augment British rule and much to foment revolution. As a result of the reports he was receiving about Gage from his subjects in Massachusetts colony, George III ordered Gage to return to England. 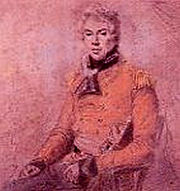 Gage was born in Firle, England the second son of the first Viscount Gage. In 1728, Gage began attending the prestigious Westminster School where he met such figures as John Burgoyne, Richard Howe, Francis Bernard, and George Sackville. Upon graduation, Gage joined the British Army, first as an ensign before purchasing the rank of lieutenant in the 1st Northampton Regiment on January 30, 1741. In 1742, he transferred to Battereau's Foot Regiment and became a captain-lieutenant. Gage received promotion to captain in 1743 and served as aide-de-camp to the Earl of Albemarle in the Battle of Fontenoy and in the campaign of Culloden. From 1747 to 1748, Gage saw action in the Low Countries, purchasing the rank of Major in 1748. He transferred to the 55th Foot Regiment and was promoted to lieutenant colonel in March 1751. In 1754 Gage, A British General, was sent to America as part of General Braddock's expeditionary force. Future military foe George Washington served with Gage in the same expedition. In July 1755, the 44th Regiment's commander, Colonel Sir Peter Halkett, was shot and killed during the Battle of the Monongahela. Gage took command of the regiment and was slightly wounded during the fighting. The regiment was decimated, and Captain Robert Orme (General Braddock's aide-de-camp at the time) leveled charges that poor field tactics on the part of Gage had led to the defeat. Orme resigned his army commission the next year, but his accusations led to Gage being denied permanent command of the 44th Regiment. Gage spent 1756 as second-in-command of a failed expedition of the Mohawk River. The following year, he was assigned to Captain-General John Campbell Loudoun in Halifax, Nova Scotia where Gage commanded the 80th Regiment and finally received promotion to full colonel. Gage was wounded again during a failed attempt to capture Fort Ticonderoga. Despite this loss, Gage was promoted to brigadier general. While recruiting locals for his new regiment, Gage met and later married Margaret Kemble of Brunswick, New Jersey—the daughter of a friend from Westminster School who now served on the New Jersey council. The two were wed in December 1758. Their first son, the future 3rd Viscount Gage, was born in 1761. 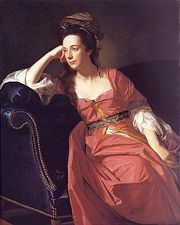 Margaret Kemble was the granddaughter of New York Mayor Stephanus Van Cortlandt. The new general was placed in command of the Albany post, serving under Major General Jeffrey Amherst. In 1759, Amherst ordered Gage to march against the French and seize Fort la Présentation (sometimes known as Fort La Galette) and then capture Montreal. Gage disagreed with Amherst, suggesting instead that his own forces be used to reinforce Niagara and Oswego while Amherst, himself, lead forces against Montreal. Gage wound up earning the displeasure of his commanding officer and being placed in charge of Fort Albany until Amherst himself was ready to attack Montreal in 1760. After the French surrendered, Gage was named military governor of Montreal. In 1761, he was promoted to major general and placed in command of the 22nd Regiment. When Amherst returned to England in August 1763, Gage assumed command of the British forces in America. Though the British were now at peace with France, Gage's new command inherited a Native American uprising already in progress on the western frontier. Gage established a new three-district command across the western, southern, and northern areas of the frontier. That same summer, Gage ordered Johnson's office to send a representative through to Pontiac. The conflict would not be fully resolved until Pontiac himself traveled to Fort Ontario and signed a formal treaty with Johnson in July 1766. Gage began withdrawing troops from the frontier to fortify urban centers like New York City and Boston. As the number of soldiers stationed in cities grew, the need to provide adequate food and housing for these troops became urgent. Parliament passed the Quartering Act of 1765, permitting British troops to be quartered in private residences. Gage personally traveled to Boston and spent six weeks there making quartering arrangements for the new soldiers in 1768. The military occupation of Boston eventually led to the Boston Massacre of 1770. That same year, Gage was promoted to lieutenant general. Late that year he wrote "America is a mere bully, from one end to the other, and the Bostonians by far the greatest bullies." Massachusetts governor Thomas Hutchinson was 62 years old at the time and the lieutenant governor (Andrew Oliver), a hated Tory, was 67. Still in his early 50s and with plenty of military experience in America, Gage was deemed the best man to handle the brewing crisis. In May of 1774, he was appointed martial law Royal governor, or commander-in-chief, of Massachusetts, replacing the civilian governor. In that capacity, he was entrusted with carrying into effect the Boston Port Act. General Gage strictly enforced the confiscation of war-making materials. In September 1774, he carried out a mission to seize the gunpowder of Somerville, Massachusetts. Gage successfully accomplished this mission but was not successful in other raids. This was in large part due to Paul Revere and the Sons of Liberty. The Sons of Liberty kept careful watch over Gage's activities after this point and successfully warned future insurgents before Gage could mobilize his lobsterbacks against them. On the night of April 18, 1775, Gage ordered 700 British regulars from elite flank companies (Light Infantry and Grenadiers) to march from Boston to Lexington and Concord. The Battle of Lexington and Concord resulted in 273 total casualties for the British and 95 for the American rebels. The British drove most of the Minutemen from their towns, but were ambushed by a gathering force of irregulars during their return march to Boston. Both Adams and Hancock escaped, and, following the battle, Gage issued a proclamation granting a general pardon to all who would demonstrate loyalty to the crown—with the notable exceptions of Hancock and Adams. Following Lexington, the American rebels followed the British back to Boston, and occupied the neck of land extending to the peninsula the city stood on. This began the Siege of Boston. Initially, the 6,000 to 8,000 rebels (led mainly by General Artemas Ward) faced some 4,000 of General Gage’s British regulars, bottled up in the city. British Admiral Samuel Graves commanded the fleet that continued to control the harbour. On May 25, Gage received about 4,500 reinforcements and three new Generals—Major General William Howe and Brigadiers John Burgoyne and Henry Clinton. Gage started work with his new generals on a plan to break the grip of the besieging forces. They would use an amphibious assault to remove the Americans from the Dorchester Heights or take their headquarters at Cambridge. To thwart these plans, General Ward gave orders to General Israel Putnam to fortify Bunker Hill. On June 17, 1775, British forces under General Howe seized the Charlestown peninsula at the Battle of Bunker Hill. They did take their objective, but didn't break out because the Americans held the ground at the base of the peninsula. Gage called it, "A dear bought victory, another such would have ruined us." British losses were so heavy that from this point, the siege essentially became a stalemate. Gage was reactivated to duty, in April 1781, when Amherst appointed him to mobilize troops for a possible French invasion. The next year, Gage assumed command (as a colonel) of the 17th light dragoons. He was finally promoted to full general on November 20, 1782, and later transferred to command the 11th dragoons. Gage died on the Isle of Portland on April 2, 1787, his wife surviving him by almost 37 years. The opinion is held by some that Gage's failure to fortify Dorchester Heights outside of Boston led to the loss and evacuation of the city. That case may be argued successfully but in fairness to Gage, he was a fast learner. By the time the Battle of Long Island ensued, Gage had developed and entire regiment of light infantry in America dressed in drab uniforms and trained to fight in open order. The men were chosen for their intelligence, energy and marksmanship. These light infantry units were largely responsible for the string of British success on Long Island and across New Jersey in 1776. So impressed with this notion was fellow British General Wiliam Howe that he took the idea to the king following the war. These special units of 1776 became the ancestors of the Green Jackets of the nineteenth century and the Green Berets of the twentieth. The light infantry of the modern army dates its roots back to Thomas Gage. ↑ National Geographic Society. Exploring America's Historic Places (Washington, D.C.: National Geographic Society, 1998, ISBN 9780792236528). ↑ David Hackett Fischer, Washington's Crossing (Oxford University Press, New York, 2004, ISBN 9780195181593), 35-36. All links retrieved November 23, 2013. This page was last modified on 24 November 2013, at 20:18.